American hasn’t wasted any time updating their digital assets with their new branding. 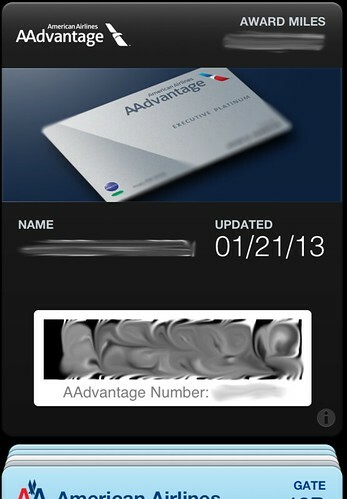 Over the weekend new versions of their iPhone and iPad apps became available which not only included the new logo, but also featured support for adding a digital version of your AAdvantage card to Apple’s Passbook. 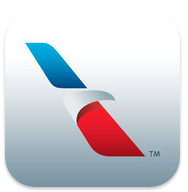 Here’s how to add your AAdvantage card to your iPhone’s Passbook. Launch the app and navigate to the “My Account” section. Select “View AAdvantage Card”. This will generate a digital version of your AAdvantage Card. Click the “Add” button in the upper, right-hand corner. 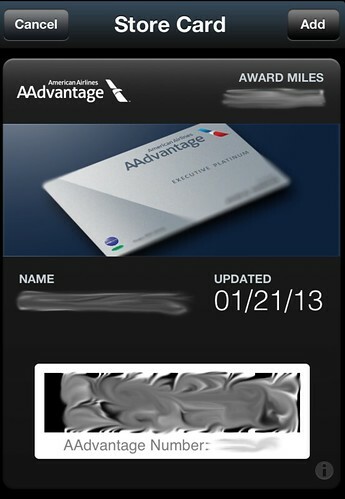 Launch Passbook to view your AAdvantage Card. (I mentioned this late during the day on Friday, so you might have missed the news) American just launched a new sweepstakes with a grand prized of 1 million AAdvantage Miles. Share a favorite travel photo for a chance to win 1 million AAdvantage Miles! Don’t forget that The Frugal Travel Guys’s Monday Deal of the Day is sponsored by AAdvantage. Go here to share your favorite American or AAdvantage travel tip for chance to win 2,500 AAdvantage Miles! Thank you for this easy step-by-step instruction. Works great! TIP: Touch the information icon “i” in Passbook for easy access to your miles log, tier status, and AA’s reservation phone number. Did you hit EXP AAdvantageGeek? Congrats! @ FEV& – Thanks for reading! @ Mark – Great tip, thanks for sharing! There is no more such option. @ CG – Yes there is. 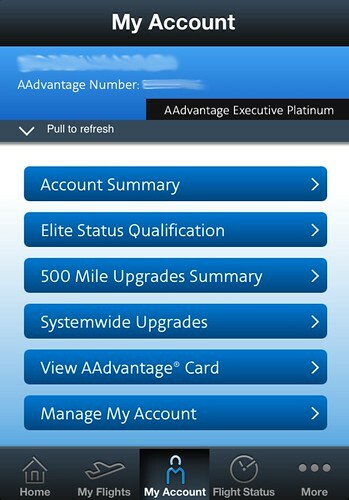 Launch the app, select “My Account” at the bottom of the screen, select “View my AAdvantage Card”. Wait for your AAdvantage Card to load, select the ‘Add’ button in the upper right-hand corner to add it to Passbook.